New Delhi: Now 21, Sanjay Kandasamy did not have an ordinary childhood. 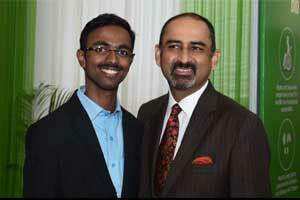 At just 20 months of age, he had a part of his father’s liver transplanted into him in November 1998. In doing so, Sanjay and his doctors created history in the annals of Indian medicine as the country’s first successful liver transplant surgery, Indraprastha Apollo hospitals said in the statement. Remarkably, not only has Sanjay done exceedingly well, he is now training to be a doctor himself. On the 20th anniversary of the operation that changed the face of medical sciences in India, the hospital showcased the evolution that liver transplants have gone through over the last two decades. Dr Preetha Reddy, the vice chairperson of the Apollo Hospitals Group, said the liver disease is a major cause for concern in the country with as many as two lakh people dying from it every year. While around 1,800 liver transplants are done annually, as many as 20,000 people need a liver transplant at any given point. “The fact is around 10 lakh people are diagnosed with liver disease every year, making it the 10th most-common cause of death in India as per the WHO. While India has come a long way since the first operation, there is still a huge gap to be filled,” Reddy said. Ace Indian cricketer, Gautam Gambhir, a long-time proponent of organ donation was also present on the occasion. “Every three minutes a person gets added to the list who need a transplant. Today, over two lakh Indians are on the list while less than 10 per cent get a transplant. We have to work as a nation to increase our organ donation rate. I have pledged my organs in 2011 and encourage the youth to raise awareness on organ donation and become donors themselves. This needs to become a national movement,” he said. Apollo Hospitals’ Group Medical Director and Senior Pediatric Gastroenterologist, Dr Anupam Sibal, said over the last 20 years the Apollo Institutes of Transplant has performed more than 3,200 liver transplants in patients from over 50 countries of which 302 have been children. “While there is still a lack of infrastructure for life-saving organ donations and transplants, the numbers in the country are showing some improvement in the country. “Out of 301 hospitals equipped to handle the process, 250 have registered with National Organ and Tissue Transplant Organisation (NOTTO), showing that in order to conduct an organ transplant, there exists one fully equipped hospital for around 43 lakh people,” Sibal said.